It may be freezing here in NYC but peanuts and jelly are in season at Bouchon! 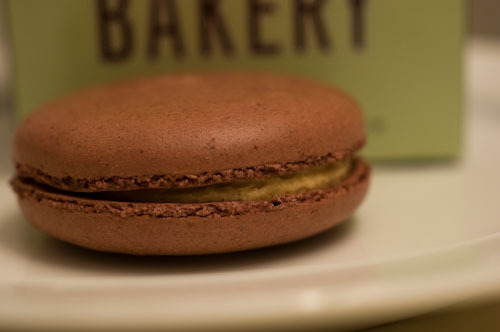 That’s right, the seasonal macaron at Bouchon Bakery is PB & J. 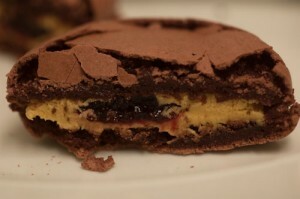 For a mere $3.25 you can get an extra large size French Macaron filled with delicious peanut butter and house made jelly. My photos don’t capture the magenta coloring of the cookie but don’t be fooled, the staff told me that despite it’s berry flavored color the cookie doesn’t have a flavor. The photo also makes the macaron look a bit “crackely”–while the crust wasn’t super soft it wasn’t hard either. Bouchon Bakery in New York City is located on the 3rd floor of the Time Warner Center at Columbus Circle. Note: It terms of size and value it’s a pretty good deal considering a macaron less than half this size goes for about $2.25 at Macaron Cafe. Tomorrow: Financier macarons. Recent macaron articles: Dessertbuzz’s favorite macarons: Dessert Truck Works, macarons without bricks and mortar stores: Mad Mac and Macaron Parlour. Don’t forget Macaron Cafe which has very soft, very fresh macarons in midtown. Sure, why not? Healthier than a Fluffernutter– though that would make a good lunch too. That sure is a slap in the face to French, I love it!! What’s next? A bacon and banana macaron? Lol. Wait, a bacon and banana macaron? has anyone done that yet?